Effortlessly secure a small vehicle, ATV, motorcycle, jet ski, boat, or other watercraft in your trailer with the ABN 15' Foot Winch Strap. Whatever you need to haul, this rope can handle up to 3,000 pounds / 1,360kg (1.5 Ton / 1.4 MT). This strap is constructed from webbing and contains reinforced loops on both ends for added safety. It has a 3,000-pound (1,360kg) rated capacity and 900-pound (408kg) safe working load. 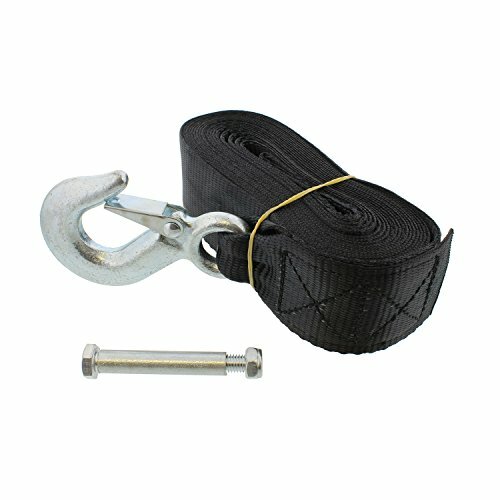 A safety hook comes sewn in at one loop end while the other loop end can be used with the included mounting bolt and locknut on a winch (winch not included). The strap will not bind up or fray under pressure up to 3,000 pounds and is lighter and easier to transport than chains. It also rolls up or folds to a perfect size for storing behind the seat or in the trunk. WARNING: This product can expose you to chemicals which is [are] known to the State of California to cause cancer and birth defects or other reproductive harm. For more information go to www.P65Warnings.ca.gov.